I just received a call on behalf of Build It Now asking for my support. She emphasized no new taxes, no raised taxes. -I asked her if Sioux Falls could raise taxes. She didn't know. -I asked her the cost of construction. She didn't know. -I asked her how much the city had to borrow to do the project. She didn't know. -I asked her what the projected interest rate might be. She didn't know. -Finally, I asked her what the annual debt service might be. She didn't know. This isn't the first time I have heard about the lack of knowledge coming from a Build It Now caller. I wonder if these callers are even local people. The prudent thing to do is at least have the basic information about the project you are representing so you can answer the basic questions about the event center you are representing. The depth of this message is a message in and of itself, good folks of Sioux Falls. Don't be confused with the facts, just Build It Now. Worry about the debt and how to operate it later. Do We Need Two Event Venues? Everybody has brought up just about everything when discussing whether this city needs to build an event center or not. Finances, revenues, build it and people will come, location, parking, chairs and pottys. What no one has specifically addressed is that with the building of a new event center, we will still have the Arena. The most compelling reasons to vote yes - and vote yes enthusiastically - are interrelated. "First, practically, this city desperately needs a modern multi-use facility to host concerts, trade shows, conventions and sporting events. The Arena has served Sioux Falls well for more than half a century, but it no longer meets the needs - by any standard - of a city of 155,000 and metro area exceeding 225,000. More critical: It is woefully inadequate for a Sioux Falls of the next 10, 20 and 30 years." Two operational budgets, two facilities competing for events, sports teams, trade shows, additional floor space for the convention center. Why isn't tearing down this event venue part of the mayor's plan if it is so" woefully inadequate?" The Arena is not being torn down. The city is dedicating 2nd penny sales tax in the capital program to upgrade the Arena. The 2012-2016 Mayor's Recommended Capital Plan has programmed over $2.4 million in Arena Building Improvements to be paid for by the Entertainment Tax. The same tax that is going to be used as a contingency to subsidize the operating costs of the Event Center in addition to paying for operating/capital improvement needs of the Washington Pavilion, Convention Center, Orpheum and the Great Plains Zoo and Delbridge Museum. The city just spent approximately half a million dollars upgrading the electronic scoreboard at the Arena. "Second, building an events center will represent an enormous symbolic victory for those who believe, correctly, that a city not moving forward is moving backward. Even more importantly, it would send a powerful message to those who oppose any vision for the future, no matter what reason they cite at the moment." Building a second event center will represent an enormous symbolic victory? The city does not need to vote yes in order to give the mayor a symbolic victory to prove he and his supporters are the only ones who are moving this city forward, not backward. This statement is preposterous and totally discounts and insults those public officials and others in the community who just don't believe this plan will work. To say no, does not mean one is backward, has no vision for the future. This isn't about sending a powerful message, this is about what is good for Sioux Falls and its future. The question remains - Does this city need two event venues competing with each other for revenues, events, entertainment tax funds for operating and capital improvements and vistors? Maybe the economic strength of a new event center is that it is the only event center in the city. The operating budget for an events center, as proposed, essentially hinges on two aspects: tenants (which drive visitors/revenue) and private funding (which will help offset other expenses related to running the buildings). The already obligated Entertainment Tax is proposed to be used as a contingency for operating costs of the new Events Center if revenues aren't sufficient. We have seen estimates from the consultants hired by the city. They are estimates, not reality. Reality is a proven track record. If someone could tell us one event facility that has operated in the black consistently since built then maybe we could believe in these "revenue estimates" for the event center. You can read about event centers all over the country that aren't making it and which require a subsidy from their governmental body. That is a fact, not an estimate, not a promise, not a forecast based on growth. So what happens if this new Events Center doesn't make money and/or the private funding is not sufficient? The recommendation is for one management company to run all three facilities. If the combined three facilities (Event Center, Convention Center, Arena) require city subsidy, the proposal is to use the entertainment tax. The entertainment tax generates approximately $5 million/year. This tax also funds the current operating subsidies for the Washington Pavilion and Convention Center, in addition to capital improvements for both buildings (new exhibits for the Pavilion, carpet for the Convention Center, etc). Some of the $5 million will free up in 2014 when bonds are paid off. But, the city has also proposed expanding the use of the entertainment tax to include the current Arena, Orpheum Theater, Great Plains Zoo and Delbridge Museum and now the Event Center. All of these facilities have equipment and other capital needs and all have required operational support from the city. In addition, they all are aging. Any other improvements/expansions of any of these facilities would also come from the entertainment tax. There have been identified needed improvements to the Arena, a recommended expansion of the Convention Center from the 2008 task force and a significant master plan that the City Council has endorsed for the Great Plains Zoo. Will those be put on hold or not done at all if the entertainment tax is needed to subsidize the Event Center operational budget in the future? The city is obligating the 2nd penny sales tax for 22 years to construct/build the Event Center. The city has outlined what those annual debt payments will be until 2033. That's all anyone is talking about it. This project is more than just constructing it. You need money to operate it. It's the annual operating expenses that people should worry about because without tenants which drive visitors and revenues, and significant and sustained private funding forever, it is probably a good bet that there will be a need for a city subsidy sometime in the future of the Event Center. To promise the event center will operate in the black due to event mix guesstimates, forecasted revenues, and promises of private funding is just plain irresponsible. The 2nd penny sales tax will fund the construction through a 22 year debt obligation. The Entertainment Tax will need to subsidize the operating and capital improvement expenses of this event center. Those are two facts to remember when voting on November 8th. Their goal is to make sure voters can make an informed decision on the current events center proposal. Both are concerned that key pieces of information are not being fairly presented to voters. 1. This Vote is About Funding Priorities – streets, fire stations, parks, libraries, transit OR an events center. Whatever we spend on an events center’s principle and interest payment is money that will NOT go to future streets, fire stations, parks, libraries or the transit system because the events center will be funded from the same limited source – our second penny sales tax. It’s also concerning that there’s no fund identified to pay for the ongoing maintenance of the facility. 3. Construction Costs Are Going up on All Projects – It’s not just the events center price tag that will go up. The cost of all critical city construction projects is likely to go up. So again it comes back to priorities for Sioux Falls. What investments do you want us to make right now. 4. No New Taxes for Events Center Because We Can’t - Like almost all South Dakota cities, Sioux Falls is at the maximum tax level allowed by state law. We can’t raise taxes because it’s against the law. All the money is coming from one source - the 2nd penny sales tax we’ve reserved for streets, fire stations, libraries, transit and other projects. 5. We’re Not Replacing the Arena - The Arena stays in play. The events center is an additional building at that complex, but there is no new planned re-use of the existing Arena. We will be competing with ourselves and will have to maintain both venues with taxpayer dollars. Plus, we have identified critical improvements to the Arena, but not identified funding to take care of it. 6. The Parking Plan Doesn’t Consider Multiple Events – The plan does not consider simultaneous events at the events center, Arena, Convention Center, Pheasants Stadium and Howard Wood Field. The parking plan is designed for a single event at the events center. 7. How Will Sioux Falls Pay For Population Growth – Experts predict our city will grow at the rate of three-thousand people a year – that’s 8 people a day. That means more houses, streets, fire stations, libraries, parks and other infrastructure will be needed – much of which is funded out of the second penny sales tax. But the plan is counting on sales tax growth paying for the evenst center debt for the next 22 years. Plus we have Master Plans for Falls Park, the River Greenway and the zoo and there’s not enough funding in the Capital Improvement Plan to complete those plans. 8. We’re Borrowing 100% of the Money – Construction costs will be $115 million, but we will have to borrow $125 million to cover the issuance cost of bonds. We will be borrowing every dime of it – no down payment. It also means we’ll be paying $60 to $70 million in interest expense. 9. We Do Not Have One Tenant Signed – Not one semi-pro athletic team has signed an agreement to use the facility. And if they do, that means the Arena loses rent. Now the primary tenants are identified as big conventions, conferences, and tradeshows. In 2010 these events represented only 16 percent of the event mix of the convention center. 10. We Can Create a Better Plan – November 8th is not your last chance for an event center. If you decide you’re not comfortable with $125 million dollars of debt, we can work together to create a more affordable plan for Sioux Falls so you can comfortably vote YES. Jamison and Brown offer two ideas. · Arena Replacement Fund - The Council could set aside money each year to build up to a 10 to 15 percent down payment on our entertainment venue to help lower interest expense. · Strive to make existing subsidized entertainment venues self sustaining - Work with the Arena, Pavilion, Zoo, Orpheum Theater and Convention Center to acquire naming rights so tax dollars don’t subsidize them. Then we can be honest with voters by saying we can build a self sustaining event center in Sioux Falls. · And then once the Pavilion and Convention Center are paid off and self sustaining the Entertainment Tax could help fund construction of a future events center. Jamison and Brown tell voters not to let anyone convince them they’re not progressive or not supporting Sioux Falls’ future just because they can’t comfortably say yes to this vote. It’s OK to say they want a better plan. People express their feelings regarding a political topic through yard signs. Sometimes, although rare, the yard signs are hand made. Those homemade yard signs seem more significant because the person took their own initiative to share their opinion through a handmade sign. One voice speaks volumes. However you feel about the Event Center plan, getting involved is a civic duty. Whether you vote yes or vote no, it still means you care about your city. You care enough to make a sign but more importantly, you care enough to tell the world where you stand on the issue. Get ready for the potty parity news conference tomorrow. Instead of staking the city's credibility on the event center presentations being made throughout the city these past weeks, the city has to resort to what seems to be desperate measures to keep the event center plan before the public. "When you buy a brand new home, you don't just look at the outside and say, 'Yep, I'm going to buy that thing.' You want to look at all the drawers; you want to look in all the closets. You want to make sure that it meets your needs," Huether said. First we had to see the comparison between the old and new chairs. We got to see the cushy chairs for the "big spenders" and the scaled down models for the ordinary good folks of Sioux Falls. Now we are going to learn about the "potty chairs" and how they are different from the potty chairs in the Arena, I suppose. Will we hear that there will be more pottys for the women in order to sway them to vote yes on November 8th? A promise of more pottys makes me want to vote yes - really? Along with the pottys, maybe we will be told that we will have upgraded toilet paper to go with those gleaming new pottys planned for the Event Center. Will we see the old potty from the Arena and the new potty planned for the Event Center? The city needs to stay on point with what is really important to the vote on November 8th - the finance plan! If we don't get the finance plan right, it won't matter where we plant our kiesters, how many more pottys there will be or whether the seats/pottys will be cushioned or plastic, square or oblong. Pink is every where. It's October. It's a reminder that I don't really like although I understand the need to build awareness. Last Saturday, my nephew Sam wore pink shoelaces and pink stockings when he went out on the Augustanta football field in honor of his Aunt Pam. I want someone to conquer the disease. I don't need a reminder. It kills. It killed my best friend in 1999. It broke my heart and took away a friend that filled my heart with love, kindness, thoughtfulness and friendship that was to endure through our retirement years. We grew up together in our twenties, raised our children together, spent every spare moment together and worked together at the telephone company in Virginia. We planned our retirement years. I don't need the month of October to remember her spirit or feel her loss as a friend. The loss is a forever feeling. I live with the threat of breast cancer. My identical twin sister is a breast cancer survivor. We live her survival every day and when she goes in for her checkups we hold our breath that survival is still the word. Losing her to this disease would be like cutting off part of my body. I thought losing my friend to the disease was almost inconsolable but losing my twin sister to the disease would be catastrophic to my life as I know it. We don't acknowledge or particpate in breast cancer walks and the like. My twin sister does not like being reminded that she had breast cancer. She says she lives it everyday. A walk in October is just another day with the disease. For others, the various events in the month of October provide peace and support. To each their own. Her daughter and I talked her into getting a breast cancer survival ribbon tatoo on our right arms. She did it because we asked her to do it with us. We thought it was a show of our support. She hates that tatoo because she says everytime she looks at her arm, it is a reminder that she had breast cancer. She is thankful each year when she gets the thumbs up news that she is still cancer free. It is that little irritating thought that sits back in the subconscious that is a reminder. October is not seen as a month of celebration. Each day, each month, each year being cancer free is a celebration in and of itself for her. When I go in for my yearly mammogram in November, I am once again reminded by the technician that I am at risk because my twin had breast cancer. I don't need a reminder. I live with a reminder, my sister. I need a cure. So I thank all those people who support breast cancer research through their donations and support. We each do what we can for the cause because the majority of us are touched by this disease one way or another. I wouldn't normally post a blog from another source but the blog posted by Joel Rosenthal, small businessman and volunteer political activist, bears sharing. Click on the link below and gain another common sense position on why this is not time to build an event center in Sioux Falls. Another voice from a person who is currently serving in a volunteer capacity as President of the Siouxland Library Board of Trustees. People who do not support the event center plan as proposed and presented to the voting public on November 8th care deeply about the community and are not the enemy of progress. There is a right way to fund and build an event center. The plan before the voters on November 8th is not the right way. Let's Build It Right instead of Build It Now. The mayor has taken to the Internet to get his message out by email. His email message is to get out the vote. Oh yes, and he thanks his contacts for everything they do for our great city and yes, for him too. He is personally laying his political vision on the line for this event center vision of his through his personal email. I would presume this email "advocacy" comes from his personal and campaign email addresses and not his official city email address. I wonder if he mined some contacts from those citizens who send him and the city emails on daily basis to his office of mayor or at the city's official website? Now that could be an "advocacy" issue. Subject: Big vote coming up. Good morning everyone. As you know, there is a major vote coming up on November 8 about the proposed event center. I just wanted to encourage all of you to vote of course on this important topic for our great city. I would also love to have you help get out the vote by cheering on your family members, co-workers and friends to also get out there and vote. The future of Sioux Falls will be impacted in so many ways by this decision. Job creation, economic development, quality of life and so much more. If any of you want to get involved in any way, let me know. Thanks for all that you do for our great city and yes, for me!!! Take care and make it a great day!! Do I believe the new event center will have an annual $40 million economic impact to the city? Will the event center operating expenses be totally covered by private business or will it need ongoing subsidies from the Entertainment Tax and the city's general fund? Can the city afford to take on 22 years of debt from the workhorse second penny sales tax that should be going to maintain and grow necessary infrastructure needs like streets, water and sewer in this economic downturn? Does the fact that there is no major tenant anchoring this new facility bother you? Do you believe in the promise of bigger events, more events and more conventions if we just build it now? Do you believe "If we build it, jobs and revenue will come?" If the answer is no to these questions, then the only clear way is to vote No on November 8th. We all care about our great city, even when we may disagree with the mayor. I got a flyer in the mail today from the Build It Now group. It would seem the theme of the flyer is a take off on the 1989 drama/sports/fantasy film called "Field of Dreams." The movie is about a novice farmer, who while walking in his cornfield, hears a voice that whispers, "if you build it, he will come" and he sees a vision of a baseball diamond. I guess, the mayor and his Build It Now companions like fantasy so much they had to adopt the fantasy film's theme of "build it and they will come" with the flyer stating "If you build it, jobs and revenue will come." There is nothing wrong with dreams and visions, but when one's dreams rely on fantasy numbers that are estimates and forecasts instead of reality and facts, one's fantasy is just that, a fantasy. 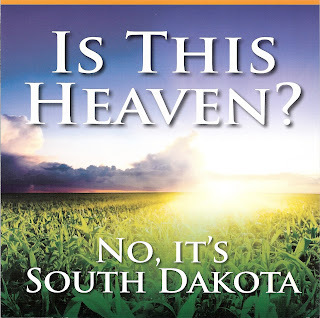 So, South Dakota is not heaven unless we build the event center? Poppycock! 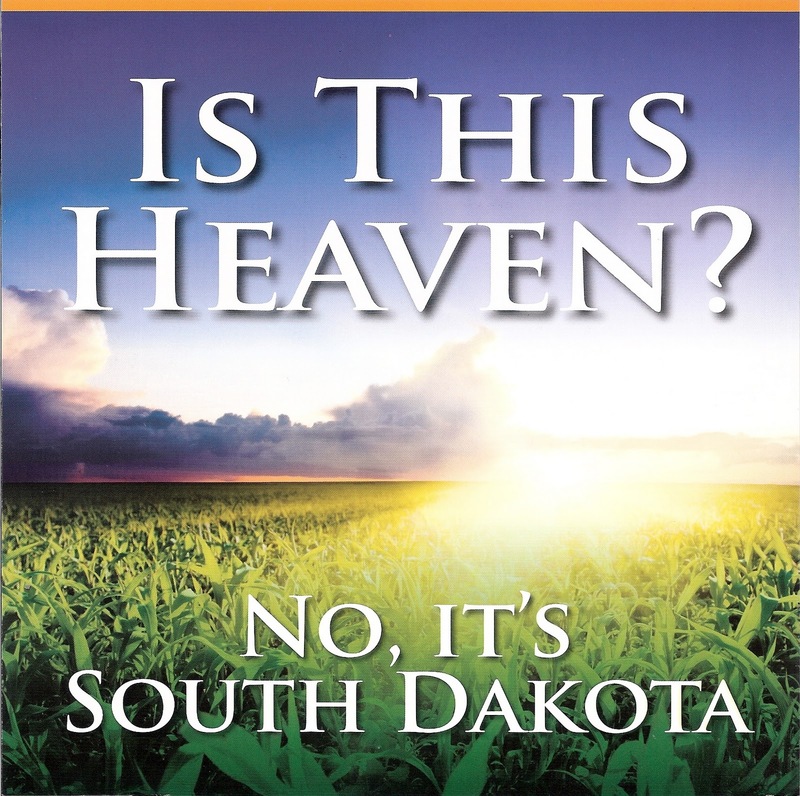 Don't hire this group to market tourism for the State of South Dakota. They said it's not heaven here. 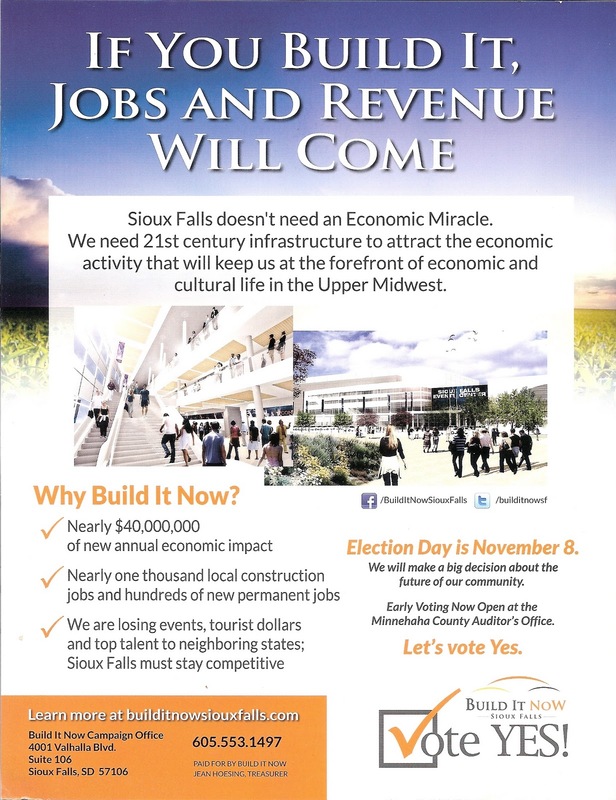 The flyer states Sioux Falls doesn't need an Economic Miracle. All we need is a structure that will generate economic activity to the tune of $40 million dollars of new economic impact a year. Where does that $40 million come from? Fantasy makes for a great movie. $40 million dollars of new economic impact each year sounds like a fantasy without facts to support it. Is building the event center now heaven? No, it's a fantasy. So, the big news conference yesterday was to tell us the difference in the seats between the Arena and the new Event Center? It's very important that the public knows what it is buying so we need to look at the difference in where our butts are going to land and sit for a few hours. Instead of worrying about the difference in the seats at the Arena versus the new Event Center, I submit we need to worry about the financing plan, both for construction and for operating the dang thing once built. The seats are the least of my concerns as a taxpayer. Press Conferences from City Hall - ad nauseam! 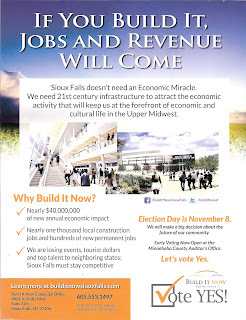 It appears, with less than 20 days to go, Build It Now is in full gear with their Vote Yes lobbying campaign. Big huge billboards are up, commercials on TV, robo calls and door hangers are the mode of communication. The mailings should be out soon. You can't put this kind of lobby effort together without big money behind it. The mayor and his administration have also been putting on the big push with their constant news releases and "advocacy" presentations. The latest press conference is to tell us the difference between that old Arena and the new Event Center. I heard the objective was to get out a press release regarding the Event Center every 10 days or so. We will see if big money can buy the election on November 8th. Why isn't there an announcement telling the voting public that the private money commitment is there to take care of the operating costs of the Event Center for the next 20 years? Who knows maybe that will be the last press announcement before the big vote. I hope if big money wins this election for the mayor, they step up to the plate and put their money where it really will count - to pay for the operating expenses of the Event Center with their naming rights money and money to buy luxury suites and seats. Then the cheap seats can at least take comfort in the fact that they are paying the big bucks to keep the lights on and the bills paid. I have to hand it to the mayor. He knows where the money is and knows how to use it to his advantage for the big push. Global Spectrum released a press announcement yesterday stating they recorded the second largest month of revenue since taking over in 2007. I guess one needs to toot one's horn even if it is only the 2nd largest revenue month in the last 4 years, especially with the Event Center vote coming up on November 8th. It's an interesting mix of events considering conventions, trade shows and consumer shows only represent 16% of the event mix in 2010. The mayor says the the primary tenant of the event center will be the conventions, the conferences, the big events, trade shows. The power of that investment is going to need a big effort by Global Spectrum once it is built in 2014 to increase that 16% event mix. With adjustments (not sure what that means) their adjusted 2010 net operating income loss was reduced to ($509,513). With losses in capital of $61,132 and a loss in other operating items of $460,225, the total 2010 SFCC expenditures was a loss of ($1,030,870). The Convention Center's source of revenue from the city is the Entertainment Tax, concert ticket sales, and miscellaneous. In 2010 these revenue sources actually totaled $1,056,552 which was down $419,206 from the 2010 Budgeted amount. They are going to need to up the revenues they produce because the entertainment tax is intended to be used as a contingency for operating subsidy to the new event center which would mean less money for the Convention Center, Washington Pavilion and the Great Plains Zoo and Delbridge Museum in the future. Let's hope this record month means the convention center will operate in the black in 2011. The convention center needs more than one month of record revenues to pay for itself. Convention Centers - The Power of This Investment? The Minneapolis Star Tribune had an interesting article about the Minneapolis Convention Center dismal financial prospects and the slashing of supervisory staff in half and placing all other staff on an on-call basis. "The city has been spending as much to subsidize the center as it takes in because operating costs far exceed rents and other charges the facility reaps from conventions, trade shows and other events. The city spent more than $13 million in 2009 from special hospitality taxes it collects to subsidize the center." Read this article and think about the event center proposal before the citizens of Sioux Falls on November 8th. The mayor, in a web interview with Argus Leader Sports Writer Stu Whitney stated that the primary tenants of the event center are not sports teams. He stated that the primary tenant will be the conventions, the conferences, the big events, trade shows. "That's the power of this investment," he stated. I guess the power of that investment is not working so well for the City of Minneapolis, Minnesota. The fact that the Minneapolis Convention Center can't make a go of it certainly brings pause to the mayor's event center plan for Sioux Falls. The Star Tribune article states: "Convention centers have been battered financially across the country, first by a post-9/11 drop in convention travel and then by the recession. Those factors affected Minneapolis just as it was opening a major expansion of the center. Centers nationally have been cutting costs and discounting rents." Ill conceived concepts of fiscal prosperity and promises of private funding that will save the taxpayer from having to subsidizing ongoing operating costs for decades and decades. The promise that the financing plan to build it or operate it won't use property tax revenues and the 1st penny sales tax revenues but doesn't say never. That the projection of $1.1 million to $2.5 million per year in positive revenue from event center activities and events will be generated for operating expenses. A projection of $36 million in new economic impact per year when there is talk of a recession next year and the economic climate is a slowdown that could last for another decade. A promise of bigger events, more events and more simultaneous events when consumer confidence and spending is at an all time low. I wish the power of this investment worked with the plan currently before the voters on November 8th. I really do. Reality is fact. We can't afford the power of investment that Minneapolis is facing today before the first first shovel of dirt is thrown. The economic climate does not project a rosy future. The only sensible fiscal action is to vote no on November 8th. Mr. Beck wrote an interesting commentary in the Sunday Argus Leader. He uses the issue of neighbors reporting neighbors who violate city ordinances by parking their boats and RVs in front of their house as a comparison to the event center debate. Mr. Beck publicly insults and demeans a private citizen in the very column where he talks about spite. Such doublespeak. To say spite is the driving force behind not supporting the mayor's event center plan is ridiculous. It disregards those in the community, both ordinary citizens and credible business leaders, who care about this community and have opinions that differ from the mayor and who are vocal in addressing those differences. All Mr. Beck did in his opinion column was reinforce the mayor's feelings of persecution that he himself voiced on Stu Whitney's Live Sports Blog. The mayor thinks those who vote no are voting no because they don't like him. Sorry, it's not about spite or dislike or personal feelings. Politics is a tough business. If you are constantly talking about getting your feelings hurt or people are out to get you because they don't like you then one should stay in the private sector. The event center vote on November 8th is not a popularity contest, Mr. Beck and Mr. Mayor. Both of you need to get over yourselves. And by the way, when do citizens get to pick and choose which city ordinance or law they want to follow and which one they want to break? Mr. Beck's logic is not logical. Have you heard the commercial produced by Build It Now that is currently on the airways? Shelby and Heather are talking about their excursions to Sioux City and Omaha to see Tim McGraw and Justin Bieber and how they wish they could've spent their $1,000 dollar event and shopping spree in Sioux Falls. The same day I heard that commercial, I read a story in the Argus Leader regarding the poverty in our school system. In May of this year, 46.8% of the elementary school students received free or reduced price meals at school. To qualify for the federally funded program, families must be at less than 185 percent of the poverty level. That put the annual income limit at $33,874 for a household of three people last year or $40,793 for a family of four. How lucky for Shelby and Heather that they had the discretionary income to blow $1,000 in one weekend to go see an entertainer and eat and shop in a distant city. Somehow, that commercial rings a little hollow after reading this article about the number of children and households eligible for free or reduced meals because of their poverty level income in this community. John: This event center vote has me wondering whether voting yes is the right thing for Sioux Falls. Judy: You know, the mayor promised there would be a down payment and now he says we have to finance the whole thing. John: You mean he is breaking his promise to the taxpayers? Judy: Not only that. There was a promise that there would be private sector funding to help pay for an event center and no one has stepped forward with any money. John: Well, if promises are broken now how do we know anything the city promises about this plan will come true? Judy: That's the thing John, promises are a dime a dozen. Its hard facts we need, not promises and projections based on estimates and a rosy picture of if we build it they will come. John: I'm voting no on November 8th. The mayor appeared on the Argus Leader Sports Web Live on October 11 and was interviewed by Stu Whitney. The mayor seems to think that people are going to vote no on the event center because they don't like him. He said people will stop at nothing to defeat this event center or defeat him. He said the no people are impacting the city negatively to hurt him. When did this whole thing become about him? The arrogance of those statements are beyond comprehension. This election is about the financial health and well being of this city. This election is about whether the taxpayers want to take on a debt of $172,763,000 until 2033. People are voting no because they don't like the location, they don't like the financial plan, they don't think there is money to operate the event center, they don't think an event center should be built on the justification of additional flat floor space for more conventions and trade shows; they think the parking plan will not accommodate simultaneous events. During this interview, the mayor said that the primary tenants of the event center are not sports teams. He stated that the primary tenant will be the conventions, the conferences, the big events, trade shows. "That's the power of this investment." But when I look at the mayor's event center presentation materials, it shows the layout illustrations for a hockey game with a 10,450 seat capacity, and a hockey game with a 3300 seat capacity; the basketball with 12,000 seat capacity and one with a 3500 seat capacity. Why is the city showing these sports illustrations when he says the primary tenants are conventions, big events and trade shows? This event center plan has an identity crisis. It doesn't know what it wants to be and for whom. It is so disingenuous to say that those who are speaking out against the event center are creating mistrust and fear. I can honestly say that my voting no has nothing to do with whether I like this mayor or not. My vote is more important than that. It's not about a person or a legacy or whether I like someone. It is about what I believe is in the best interest of this city. I do not believe this plan before the voters on November 8th is the best economic plan for this city at this time. In the rush to push an event center through, we seem to have forgotten what other fiscal unknowns and necessities might be on the horizon for years to come. Add to the list of unknowns - the Lewis & Clark water project. Nobody seems to be talking about the Lewis & Clark Regional Water System these days. Maybe the reason is that the construction project schedule will come to a screeching halt with the lack of future federal funding on this project. The one thing that is clear these days is that the ability to count on the federal government to meet its commitments and/or obligations is long past. We heard recently that the federal funding for the city's transit system may be in jeopardy which would not be a surprise considering what the feds have done with their supposed commitment to fund Lewis & Clark. This project has become bogged down in the politics in Washington due to the mounting federal deficit and earmarks for local and state government projects. In current dollars, the estimated cost of the entire Lewis & Clark project is said to be approximately $537 million. The project needs $35 million a year to stay on schedule and as reported in the Winter 2010 Explorer Newsletter, they were already 2 years behind. $2 million in federal funding was proposed for FY 2011, with $1,996,000 actually funded of which $300,000 was set aside for the Bureau of Reclamation's administrative oversight. Only $493,000 in federal funding has been proposed for this project in FY 2012. A far cry from $35 million a year needed to keep things going. 20 local members and 3 states have made pre-funded payments which allowed Lewis & Clark to somewhat maintain their construction schedule. The city, in the 2006-2007 time frame, added approximately $70 million to the city's debt which was secured by the second penny sales tax (to get a good rate) with the actual debt service to be paid annually out of the water fund. The water fund is a city enterprise account which means its fees/rates for water service is set and charged to the consumer in order to pay for its infrastructure and maintenance needs and debt service. The future construction schedule for Lewis & Clark Regional Water System is entirely dependent upon federal funding as the $153.5 million in prepayments has been spent or obligated towards current construction projects. The federal government has appropriated $202.1 million (51% of its cost share) and has $194.3 million remaining which is increasing annually for inflation. No federal dollars means some members will not be connected to the system. Other members will pay more for the water. It means those members who prepaid their share will also have come up with the federal portion of their cost. The City of Sioux Falls bonded the pre-payment to Lewis Clark for its share of the cost. It is a debt that will grow if the feds don't appropriate anymore money for its share. It looks to be pretty sure debt that the city will have to increase in the future. Add that possible debt to the possible debt if the feds don't come through on transit funding for the city's transit system. Debt is adding up and we haven't even added that 22 year debt out of the second penny sales tax to finance the new event center. Add another fiscal unknown to the list of fiscal unknowns. It makes one nervous. Transit Service - It's dang expensive! Bus ridership is growing in Sioux Falls. It's not hard to understand if you look at the people waiting at the bus stops and and at the downtown terminal. In the long term, the increase in riders could reflect a growing dependence on public transportation, Mayor Mike Huether said. That's exactly right, mayor. A growing dependence on public transportation is reflective of our times when money is scarce, expenses are going up and choices have to be made whether one can afford a car, gas and maintenance or whether that money goes for rent and food instead. It is not surprising to understand the demographics of the ridership of transit - the working poor, the elderly, the disabled, the unemployed, the people who have less money to make ends meet. Kudos to city staff who are looking at ways to be more efficient when they have less money to work with by revamping routes and looking to maximize shorter route times while maintaining ridership satisfaction. It is concerning that Sioux Area Metro might be faced with a loss of federal money because the transit service is a necessity in this community. Transit services have always required an additional subsidy in which to operate. It has never operated in the black.With that necessary public service comes very strong economic concerns on how to pay for transit services for the citizens in our community who need to get to their doctor, their low paying job, go to the grocery store when they don't have any other means of transportation. "Public transportation is going to be a central need for our future. Who knows where that's going? ", the mayor said. Exactly! "It's dang expensive," Huether said of public transportation, and "the federal government has been a major investor in the past." Right on again mayor, another financial concern out there on the horizon and yet we continue to push this community to a 22 year debt on the 2nd penny sales tax and a possible drain on the general fund which is financed by property tax and the 1st penny sales tax if the revenue projections and private money doesn't come to fruition. Funding the basic services of local government is dang expensive and who knows where it's going to come from in the future. I guess Build It Now can rest easy. The opposition has finally showed up and they have someone to target, The Citizens Network Against the Event Center. It's like David and Goliath and Build It Now wants everyone to know they are Goliath and have all the answers. Just trust me, says Goliath. I am here to save you from what you think you may know about the Event Center. This group and the mayor have been asking for months - who and where is the opposition. We need someone to fight in order to make our case that our idea is the only right idea to move the event center vision forward. Some money from big corporations trying to sell the kool-aid of city hall. The question is whether their money is really invested in a vision that is in the best interests of all the taxpayers of Sioux Falls or whether their money is invested for personal gain and corporation interest. A debt that will saddle the workhorse second penny sales tax for 22 years. The false promise of jobs creation when in fact the majority of jobs created at construction are just temporary jobs and permanent jobs are around 180 not 1500. The ill-conceived parking plan that will be a nightmare with the occurrence of simultaneous events at the proposed venue. The promise that current plans for streets, parks and other projects remain intact and no planned projects have been eliminated to pay for the Event Center but doesn't take into account that necessary infrastructure projects will surely be impacted in future capital program needs. That using the Entertainment Tax revenues as a contingency to cover operating expenses won't impact negatively on the needs of the Washington Pavilion, Orpheum and the Great Plains Zoo and Delbridge Museum. The "David" in this battle sees that the time is not right and the promises don't add up. OccupyWallStreet demonstrations are cropping up all over the country. I said to someone the other day, that I was wondering when the "silent middle" was going to speak out in contrast to the Tea Partiers. It seems the "99%" are finding their voice. What started as a demonstration against corporate greed on Wall Street, seems to be catching some steam across the country. What do the protesters want? A solution to the jobs crisis, corporate money out of politics, fairer tax rates, and policies that work for 99% of Americans instead of the 1% at the top. The interesting thing about this new emerging "revolution" is that it is basically leaderless yet it is bringing together Americans who feel disenfranchised with what is happening on Wall Street, in Congress and to our economy. I do worry that this country is going down a dark and dangerous economic abyss and no one seems to be able to provide the lifeline. Oh sure, President Obama thinks he has the solution in short term fixes. The Republicans think they have the answers too. There are extremes in every political debate - extremes in the Tea Party movement and extremes in this new movement. If we could just push aside the talking heads of the extreme left and the extreme right, you can see common sense in both movements. When I look at the documents which seem to be the cornerstone of each movement, the Contract for the American Dream makes a heck of a lot more sense to me than the Tea Party activists' Contract from America. Isn't it interesting that one contract says "for" and one contract says "from"? The Contract for the American Dream is aimed at ordinary citizens while the Contract from America is aimed at candidates for political office. The extreme right is calling this new movement communists. I think the quote by Dr. Samuel Johnson is appropriate: Patriotism is the last refuge of the scoundrel. Before everyone goes to their corners and starts shouting their position the loudest, take a break. There is a lot to worry about and the last time I looked we were ALL Americans. People need to read more, become educated, think, rather than just watching the talking heads shout verbal vomit. Not everyone is going to agree, but listening to all sides of the argument usually ends in a more informed decision. Why does one side have to always be the right one and one side has to be wrong one and the side you happen to be on gets vilified by the other one? When compromise became a dirty word and when differing positions and beliefs are vilified to make one's point is when things don't get done. The extreme right in one corner, the extreme left in the other corner and then all these other citizens in the middle. Welcome to the now of America. Important news out of city hall today - the community development department lead by Darrin Smith continues to grow and evolve into "the economic development" department. There are two very significant organizations in this community who have been the lightning rod for economic development and job creation in this community: Forward Sioux Falls and the Sioux Falls Development Foundation. When business leaders in the community formed Forward Sioux Falls in 1987 their bold initiative was "to create new jobs and stimulate capital investment in the Sioux Falls area. It was developed as the result of joint cooperation and planning between the Sioux Falls Area Chamber of Commerce and the Sioux Falls Development Foundation." This group continues to be a force in economic development to date, raising millions of dollars from investors in the community to further economic development and job creation. In 1954, business leaders created the Sioux Falls Development Foundation, a non-profit development corporation that facilitates the attraction of new businesses, the retention and expansion of existing firms and the formation of new companies. Their services include business location assistance for new and expanding firms, comprehensive information on industrial park land, available sites and industrial buildings, utilities, demographics, labor statistics, business and tax climate and quality of life. I think I will lay my trust and expectations for results with these two community based organizations when it comes to economic development and creating jobs. What is interesting with this announcement is the continued neutering of the coordination and leadership of the development side of the Planning and Building Services Department. Smith has now added another Planning/Building Services employee to his department, the new position and employee comes from the zoning enforcement division. I would like the CD director to expand on his statement that this internal restructuring will provide the highest level of customer service to the residents, neighborhoods and development. Sounds like there hasn't been a high level of customer service coming out of the Planning/Building Services Department and that's the reason for the internal reorganization. Work with development groups, as well as private developers and consultants, to assure timely and effective development of the city. Oversee development and implementation of comprehensive development plan for the city of Sioux Falls. The Director of Community Development/Public Parking is responsible for urban renewal, block grant funding and public parking. There is nothing in that job description that talks about economic development as it does in the job description duties currently assigned to the incumbent director of planning/building services. Maybe these two departments should be combined into one and the two directors duke it out for king of the hill. I can tell you where my money would go on that fight - with the director that has decades of planning and development experience. Not with the director who ran non profits related to health issues with no education, experience and training in planning, urban/economic development and job creation. The dismantling of the planning/building services department continues. I just wish the new "King of the Hill" had some experience in his takeover of the responsibilities of a seasoned, experienced director. Let me get this straight - the Attorney General Marty Jackley threw the proverbial ball back to the City and the City Attorney and possibly the Ethics board to resolve the legality issue of whether the advocacy position of the Mayor regarding the Event Center violates state law? Isn't it the City Attorney's position that the Mayor's Event Center presentations do not violate state law? So the Attorney General thinks the City should deal with their own legal opinion. What a joke. You can call this whole thing political; the mayor did when he said, "there are some people out there who will use every tactic available to make this thing fail." Call it whatever you want, but when a question is asked regarding the legality of state law, the public deserves a legal response from it's highest legal officer in the state. All Jackley did was continue to fan the flames of political discourse in this community. He did not do his job. This question deals with state law, it does not deal with city ordinances. As such, it deserves a response from state officials. It does not belong in the City Attorney's office or the Ethics Board which is overseen by the City Attorney. If somebody wants to take action, file with the states attorney's office. Don't go to the Ethics Board. The attorney general legal opinion stated: Whether such expenditures are impliedly authorized requires close review of the initiated or referred measure and a review of those powers expressly granted under statute. The expenditures would have to be judged on an individual, case-by-case basis. Why this attorney general did not chose to look at this current issue on an individual case by case basis is confusing. How about the city council take this issue seriously and do the people's work. They could resolve the cloud of controversy one way or another by formally requesting a legal opinion of the Attorney General. I wouldn't hold my breath on that idea. There is no one down at Carnegie Hall to bring this group together into meaningful thoughtful discourse or action. Thank the mayor for leading them down the path of insignificance and indecision. Maybe Citizen Barclay should put in a formal request to the mayor's office to have city staff help produce his handouts and give him the schedule of weekly city presentations so he could be present to offer a different "advocacy." The public is entitled to a pro/con discussion in order to make an informed decision at the voting booth. A one sided "communication/education/advocacy" approach to this major initiative does a disservice to the taxpayers of this community. Nobody is guarding the hen house, least of all the attorney general. What does a Vote No on November 8th Really Mean? Most people in this community support an event center for Sioux Falls because it is recognized as the future economic engine for this city. The vote on November 8th isn't a vote on whether you support an event center in Sioux Falls. The vote on November 8th is whether you support an event center at the Arena/Convention Center location by borrowing $115 million for construction and another $10 million in interest from the second penny sales tax. The vote on November 8th cements taxpayers to a nebulous plan for funding annual operating costs by the private sector. It is a vote on the mayor's vision for an event center. A vision supported and approved by only 4 other city councilors. Voting no on November 8th doesn't kill the event center idea. no to under funded maintenance and growth of city streets and infrastructure because of debt payments for an EC. no to a financial plan that is based on economic forecasts that promote steady economic growth in a economic climate where there is sluggish job growth and a lack of consumer confidence. Maybe once this vision is voted down, the city and taxpayers can get to an event center concept that makes sense both economically and commercially and one that truly captures the economic impact to the community for decades to come. A vote no means we can finally move forward with a better event center plan. Vote no on the mayor and his 4 councilor followers vision for an event center on November 8th. Then, let's get down to business on a plan that makes economic sense both now and in the future. I get the feeling that city government does not do its homework before it speaks and at times, officials say different things about the same subject. The location and construction of an event center, a special election, the firing of Sally Felix and Debra Owen - speak, then double speak. Spin the bottle and hope it lands on someone who knows what the h.... is going on down there. The rumblings regarding the city administration's event center presentation push has been going on since the mayor announced the big push to "educate" the public on his vision. The mayor stood before the Downtown Rotary Club on Monday and said "I am going to advocate for this. I am." When challenged on his proudly stated advocacy, he said things have changed and then immediately threw the hot potato to the City Attorney. This train of advocacy at City Hall left the station back in 2010. The mayor had a vision and all the minions were told to get on the train or get off. It was the message of my way or the highway, people. The advocacy started 18 months ago and continues today through the one sided event center presentations lead by the mayor and his city directors. I looked at the presentation. There is no pro/con positions stated in the presentation. Even the ballot on the "advisory" special election pontificates/advocates no new taxes. The thing is the city published the presentation materials with taxpayer money. City staff produced the materials on city work time. City staff attend the presentations on city work time. City expenditures are being used to "advocate" the building of an event center. Can a municipality, county, or school district expend public funds to advocate a position on an election measure? ANSWER: Upon review of the South Dakota statutes I can find no statutory provisions that may in any manner be construed as explicitly giving adivision of local government the authority to expend public monies for purposes of influencing election results. In fact, any claim that the expenditures are impliedly authorized under statute would be unreasonable. Can a municipality, county, or school district expend public funds to provide information as to the impact of an election measure on the respective entity? ANSWER: Assuming that the use of public funds for such purpose is authorized, to avoid any claim of misappropriation the governing board involved must be careful to ensure that the published information constitutes a fair presentation of the relevant facts on both sides of the election issue. Along such lines, it would not be sufficient to merely refrain from exhorting a yes or no vote. Other language or statements prepared and designed to influence public opinion would also be improper. Any determination of the propriety or impropriety of the publication and ultimately the expenditure would turn on a consideration of various factors, including the style and tenor as well as the timing of the publication. Hmmmmm, you be the judge. I am just relying on the words of the mayor when he said on Monday, that he was advocating for the event center. 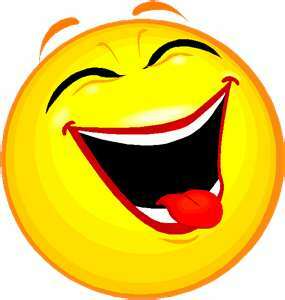 I chuckled when I read airport security closes down at 8 p.m. If you are not through security by 8 p.m. you are the loser. Now we find out that airport officials and TSA officials will try to talk more to each other in order to make sure passengers can get through security and to their gate if they have a departure flight after 8 p.m. They are in the same building but their business operating plans took off on different airplanes. The concern has been overtime for security workers. How about meeting the needs of the traveling public who pay an arm and a leg to get on an airplane? Try out a little creative scheduling of security workers in order to serve the flying public instead of getting home in time to watch the new fall schedule on TV. They must not have heard about all that business acumen down the road at City Hall. We may be the "big" city in South Dakota, but we still are little town America where airport services and security close down at 8 p.m. and the city lights start flashing at 10 p.m. Mayberry Falls has a ring. The thing about reality is that it has a way of mucking up plans for the future. The latest dose of uncertain economic times is in the form of transit services and the implications to the City of Sioux Falls and the bottom line regarding finances. Nothing is certain, but state and local officials are cautious about the probability of losing important federal funds necessary for the operation of the Sioux Area Metro and Paratransit bus services. Steve Metli, former City Director of Planning & Building Services and now chair of the South Eastern Council of Government's Urbanized Development Commission stated, "It will be a huge blow to Sioux Falls if we lose transit funding and paratransit funding. They are both very critical for moving people around town and in particular people who have needs." What has historically been stable federal money, could now be in jeopardy due to the mood of Congress and it's "cutting the deficit" agenda. Why would we think jurisdictions of 200,000 in population would be saved when the mood in Congress has been to cut education, cut services to the poor, cut unemployment benefits, elderly benefits and basically leave the poor and middle class at the bottom of the economic totem pole. $2 million in federal subsidies per year and an additional 40 to 50,000 dollars in transportation grant money may be in jeopardy. Although two Senate committees with jurisdiction over transportation issues are chaired by SD Senator Tim Johnson, there is no feeling of confidence that our Democrat Senator can deliver when the Republican held House is hell bent on making cuts in the federal budget. This is one of those oxymoron situations that collide with reality when local and state governments want and need federal subsidies and Congress wants to reduce the deficit. They don't match up, good folks of Sioux Falls. The point is we are in very uncertain economic times and we are getting ready to vote on the biggest economic decision this city has faced in decades. Reality is beginning to bite and leave marks. I like to hear visionary ideas like the one that surfaced regarding what to do with Joe Foss School. The thing with visionary ideas is that it requires long range planning including economic trend analysis for feasibility. If you are wondering what and where is Joe Foss School, it is a two story brick building built in 1923 on Cliff Avenue between Second and Third Streets. You can talk about ideas and take tours and imagine what something could be but the one thing that usually stymies this kind of visionary thinking is the reality of finances. I like the idea that city officials are thinking the "what ifs" when Joe Foss School becomes vacant in 2014. However, the real question is - will there be money in the city's capital program in 2014 and the years beyond for this kind of visionary thinking? If the event center passes on November 8th, up to $10 million a year for the next 22 years will be sucked out of the city's capital program. Add to that the ongoing maintenance needs AND the growth needs of the city's infrastructure related to streets, water, sewer, storm drainage, fire stations, police and fire staffing and just running general government needs and you wonder whether the city will even be able to fund such visionary ideas like maybe a community center in one of the city's oldest neighborhood much less the "necessary" needs of the community. Nice thought, but reality usually hits you square between the eyes. Money only goes so far when the promises are no new taxes for a grand idea that will take bucket loads of money for decades and decades to run and maintain in an area of the city that hasn't grown economically for the past couple decades.